کریم زاده خویی, مهران, سلطانی, رضا, حیدرزاده سهی, محمود. (1395). تاثیر فرآیند لیزر بر رفتار خوردگی آلیاژ منیزیم AZ31 پاشش حرارتی شده با پودر WC-Co-Cr. نشریه علوم و مهندسی سطح, 12(29), 45-54. مهران کریم زاده خویی; رضا سلطانی; محمود حیدرزاده سهی. "تاثیر فرآیند لیزر بر رفتار خوردگی آلیاژ منیزیم AZ31 پاشش حرارتی شده با پودر WC-Co-Cr". 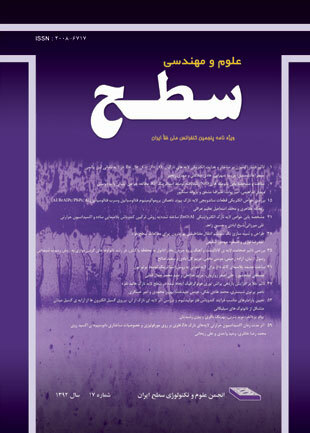 نشریه علوم و مهندسی سطح, 12, 29, 1395, 45-54. کریم زاده خویی, مهران, سلطانی, رضا, حیدرزاده سهی, محمود. (1395). 'تاثیر فرآیند لیزر بر رفتار خوردگی آلیاژ منیزیم AZ31 پاشش حرارتی شده با پودر WC-Co-Cr', نشریه علوم و مهندسی سطح, 12(29), pp. 45-54. کریم زاده خویی, مهران, سلطانی, رضا, حیدرزاده سهی, محمود. تاثیر فرآیند لیزر بر رفتار خوردگی آلیاژ منیزیم AZ31 پاشش حرارتی شده با پودر WC-Co-Cr. نشریه علوم و مهندسی سطح, 1395; 12(29): 45-54. در این مقاله، آلیاژ منیزیم AZ31 پاشش حرارتی‌شده با پودر پیش ‌نشست WC-10%Co-4%Cr پس از ذوب سطحی توسط لیزر پالسی Nd:YAG به منظور افزایش مقاومت به خوردگی مورد بررسی قرار گرفت. ترکیب شیمیایی، فاز و میکروساختار لایه کامپوزیتی ایجادشده تحت این فرآیند به وسیله میکروسکوپ الکترونی روبشی مجهز به طیف‌سنج انرژی پرتو ایکس و پراش‌ سنج پرتو ایکس بررسی شدند. بعد از فرآیند لیزر ترکیبات بین فلزی مختلفی از جمله Cr2O3، W2C در لایه کامپوزیتی، شناسایی شد. این لایه به طور عمده حاوی ذرات کاربید تنگستن، کروم و کبالت پخش‌ شده در زمینه منیزیمی بود. در این مقاله، علاوه بر بررسی خواص خوردگی، بررسی سختی لایه حاصل از فرآیند لیزر توسط دستگاه میکروسختی‌ سنج نشان داد سختی آلیاژ منیزیم AZ31 از حدود 5±50 ویکرز برای آلیاژ پایه به حدود 10±200 ویکرز برای لایه حاصل از فرآیند لیزر افزایش یافته است. بررسی رفتار خوردگی نمونه تحت فرآیند لیزر و مقایسه آن با آلیاژ پایه به وسیله آزمون پلاریزاسیون تافل در محلول 3/5 درصد کلرید سدیم انجام شد و با تعیین متغیرهای به دست آمده از منحنی‌های پلاریزاسیون و مقایسه آن‌ها به آلیاژ پایه مشخص شد میزان مقاومت به خوردگی نمونه تحت فرآیند لیزر با پودر پیش ‌نشست WC-Co-Cr به میزان سه برابر نسبت به آلیاژ پایه افزایش یافته است. 1. M. Gupta and N. M. L. Sharon, , magnesium alloys, and magnesium composites: John Wiley & Sons, Magnesium,(2011)1-6. 2. F. Froes, D. Eliezer, and E. Aghion, The science, technology, and applications of magnesium, Jom, 50(1998)30-34,. 3. I. Polmear, Magnesium alloys and applications, Materials science and technology,10(1994) 1-16. 4. H. Dong, Surface engineering of light alloys: Aluminium, magnesium and titanium alloys: Elsevier, (2010)3-33. 5. J. T. DeMasi-Marcin and D. K. Gupta, Protective coatings in the gas turbine engine, Surface and Coatings Technology, 68(1994)1-9. 6. A. Maiti, N. Mukhopadhyay, and R. Raman, Effect of adding WC powder to the feedstock of WC–Co–Cr based HVOF coating and its impact on erosion and abrasion resistance, Surface and Coatings Technology, 201(2007)7781-7788. 7. T. Rhys-Jones, Coatings for blade and vane applications in gas turbines, Corrosion Science, 29(1989)623-646. 8. R. Wood, B. Mellor, and M. Binfield, Sand erosion performance of detonation gun applied tungsten carbide/cobalt-chromium coatings, Wear, 211(1997)70-83. 9. M. Campo, M. Carboneras, M. López, B. Torres, P. Rodrigo, E. Otero, et al., Corrosion resistance of thermally sprayed Al and Al/SiC coatings on Mg, Surface and Coatings Technology, 203 (2009)3224-3230. 10. J. Wang, D. Li, Q. Liu, X. Yin, Y. Zhang, X. Jing, et al., Fabrication of hydrophobic surface with hierarchical structure on Mg alloy and its corrosion resistance, Electrochimica Acta, 55(2010)6897-6906. 11. V. De Souza and A. Neville, Corrosion and erosion damage mechanisms during erosion–corrosion of WC–Co–Cr cermet coatings, Wear, 255(2003)146-156. 12. V. Souza and A. Neville, Corrosion and synergy in a WC Co Cr HVOF thermal spray coating—understanding their role in erosion–corrosion degradation, Wear, 259(2005)171-180. 13. L.-J. Wang, P.-X. Qiu, L. Yan, W.-X. Zhou, G.-q. Gou, and C. Hui, Corrosion behavior of thermal sprayed WC cermet coatings containing metallic binders in saline environment, Transactions of Nonferrous Metals Society of China, 23(2013) 2611-2617. 14. M. Takeda, N. Morihiro, R. Ebara, Y. Harada, R. Wang, and M. Kido, Corrosion Behavior of Thermally Sprayed WC Coating in Na2SO4 Aqueous Solution, Materials Transactions, 43(2002)2860-2865. 15. J. Perry, A. Neville, V. Wilson, and T. Hodgkiess, Assessment of the corrosion rates and mechanisms of a WC–Co–Cr HVOF coating in static and liquid–solid impingement saline environments, Surface and Coatings technology, 137(2001) 43-51. 16. C. Lee, J. Han, J. Yoon, M. Shin, and S. Kwun, A study on powder mixing for high fracture toughness and wear resistance of WC–Co–Cr coatings sprayed by HVOF, Surface and coatings technology, 204(2010)2223-2229. 17. J. Nerz, B. Kushner, and A. Rotolico, Microstructural evaluation of tungsten carbide-cobalt coatings, Thermal Spray Technology, 1(1992) 147-152.